Apple rushed to file a last minute request with the court to stop Samsung from making public a series of sensitive sales data documents related to the iPhone and iPad when it cross examines Philip Schiller, Apples Senior Vice President of Worldwide Marketing, later today. The judge presiding over the patent case between Apple and Samsung has worked to keep the closely watched trial, and all related evidence, as transparently open as possible, but has allowed both parties to argue in support of sealing specific, confidential evidence on a case-by-case basis. In addition to sales and marketing data, Apple's various motions to keep evidence private and confidential have also included iOS source code, which the company holds to be particularly sensitive. Apple has most recently filed two motions related to eight confidential trial exhibits of sales data, which the company's attorneys described as "a particularized, document-by-document showing of good cause and compelling reasons for sealing of Apples most competitively sensitive information." The motions included "declarations from several of its executives attesting to the value of this information, the efforts Apple has undertaken to maintain its secrecy, and the harm that Apple would suffer if it were publicly disclosed." Apple stated that it had originally filed a motion last week to seal four documents Samsung had said it would use during Schiller's cross examination scheduled for today, but added four more after being notified last night after 9 PM by Samsung that it planned to use another four. The documents in question include iPhone, iPad and iPod touch sales summaries, an iPad tracking study, and a series of quarterly iPhone buyer surveys conducted over the past two years. Apple also objected to Samsung's last minute surprise notification of the additional documents it planned to present today, but asked the court that "only excerpted portions of those documents be entered into evidence" if it decided to allow the late filings. The iPhone maker has proposed using excerpted versions of various sales report and other documents it holds to be confidential, putting only a few specific, relevant pages of the hundreds of pages of the documents in question into evidence in a manner than would become part of the public record. Apple argued that this "would lessen the burdens on the jury and the Court and would balance the public interest in access to court records and Apples interest in maintaining secrecy of its valuable trade secrets," but noted that it was "unable to reach agreement" with Samsung on the matter. 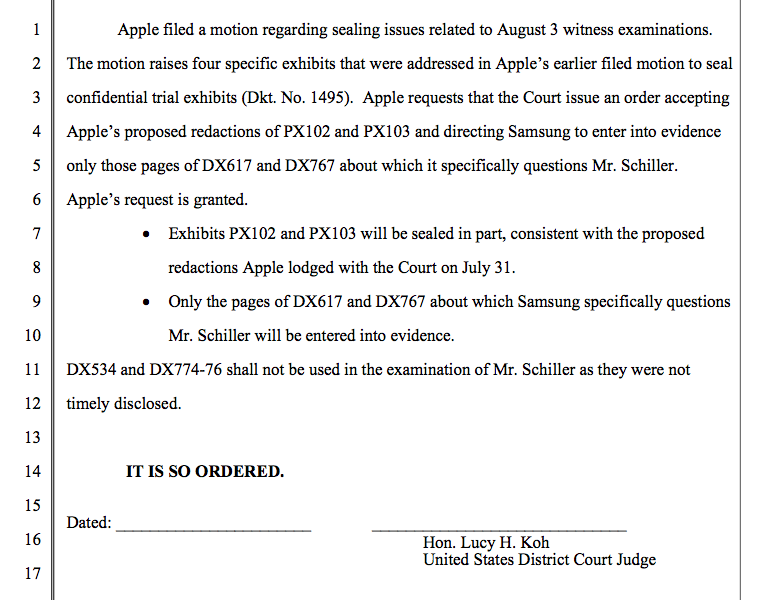 In response to Apple's motion, US District Court Judge Lucy Koh ordered that two exhibits on iPhone, iPad and iPod touch sales summaries would be sealed in part with the redactions Apple requested earlier in the week, and that only the relevant pages of two studies Samsung plans to question Schiller about will be entered into evidence. The additional four documents Samsung announced it would use today "shall not be used in the examination of Mr. Schiller as they were not timely disclosed," the judge wrote in her response to the motion.